The Construction Specifications Institute advances the process of creating and sustaining the built environment for the benefit of the construction community by using the diversity of its members to exchange knowledge. 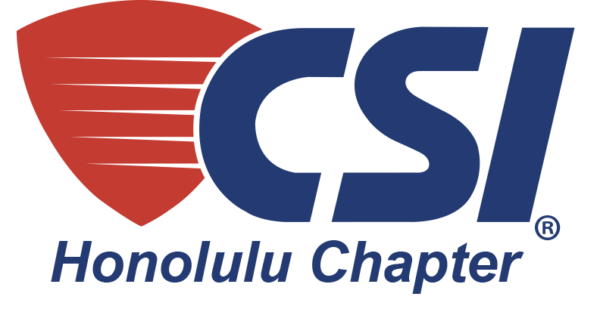 Thank you for your interest in joining the Honolulu Chapter of the Construction Specification Institute. Membership enrollment form is available on line at: www.csinet.org where you will also find detailed information on the services that CSI provides to its members. Since it’s founding in 1948, CSI has established and continues to refine the widely accepted standards for construction documentation including the CSI Manual of Practice, Master Format and the Uniform Drawing system. Involvement in CSI provides an opportunity to keep current with the latest construction technology and to network with architects, contractors, building managers and product representatives. The Honolulu Chapter meetings are the third Tuesday of each month at the Plaza Club, 900 Fort Street Mall with tabletop and no host bar starting at 5:30pm. Please call our CSI answering machine at 808-847-1862 for information on the next meeting and to make reservations. The Honolulu Chapter publishes the Hawaii Building Products Directory, sponsors the AIA/CSI product show and offers certification and educational programs throughout the year.